US scientists have conducted potentially revolutionary research that could force a rewrite of the Standard Model, the theory for how particles interact, which has been accepted by physicists since the 1970s. A team at the University of Maryland studied the behavior of leptons, tiny subatomic particles that form the building blocks of our universe, during the initial run of CERN’s $9 billion research facility in 2011 and 2012. Leptons are highly unstable, and decay at a fast, but previously predictable rate. Yet scientists noticed that there was a mysterious force that was affecting this process, when they studied the readouts from the Swiss facility. The impact was small, and the team is still unsure about the explanation for it, but the effect was consistent, and unaccounted for in the Standard Model, which explains almost all particle phenomena, and even helped predict the existence of the Higgs Boson, which has since been proven to be real. "The Standard Model says the world interacts with all leptons in the same way. There is a democracy there. But there is no guarantee that this will hold true if we discover new particles or new forces," said Maryland professor Hassan Jawahery, ahead of the publication of his study in Physical Review Letters. "Lepton universality is truly enshrined in the Standard Model. If this universality is broken, we can say that we've found evidence for non-standard physics." The research is particularly important, as it indirectly builds on another experiment, the Stanford University-based BaBar study, which has been in progress since the 1990s, and also appears to contradict the Standard Model. “The experiments were done in totally different environments, but they reflect the same physical model. This replication provides an important independent check on the observations. The added weight of two experiments is the key here. This suggests that it's not just an instrumental effect - it's pointing to real physics," said Brian Hamilton, one of the study authors, in a press release published by the University of Maryland. The Maryland team say they will now mine data from current CERN experiments, to see if an explanation can be found for the new force. "We are planning a range of other measurements. The LHCb [Large Hadron Collider beauty] experiment is taking more data during the second run right now. We are working on upgrades to the LHCb detector within the next few years. If this phenomenon is corroborated, we will have decades of work ahead. It could point theoretical physicists toward new ways to look at standard and non-standard physics," Jawahery said. While the study of particles that are one-hundred-million-billionth of a meter might seem esoteric, researchers say that leptons could give the key to understanding the entire universe. "Any knowledge from here on helps us learn more about how the universe evolved to this point. For example, we know that dark matter and dark energy exist, but we don't yet know what they are or how to explain them. Our result could be a part of that puzzle. 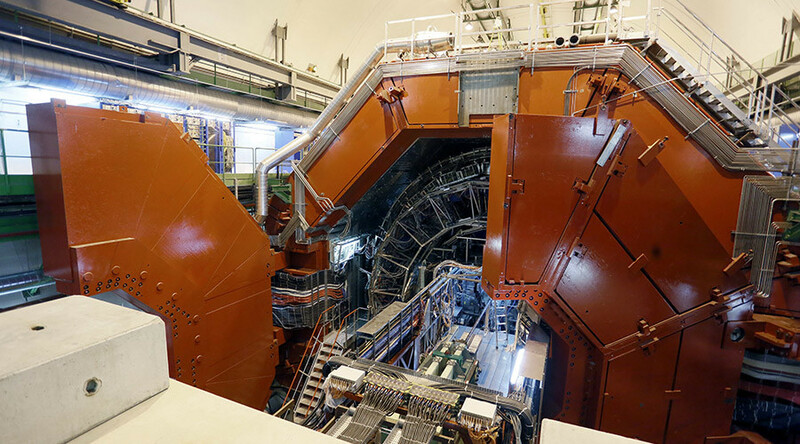 If we can demonstrate that there are missing particles and interactions beyond the Standard Model, it could help complete the picture," Jawahery said.